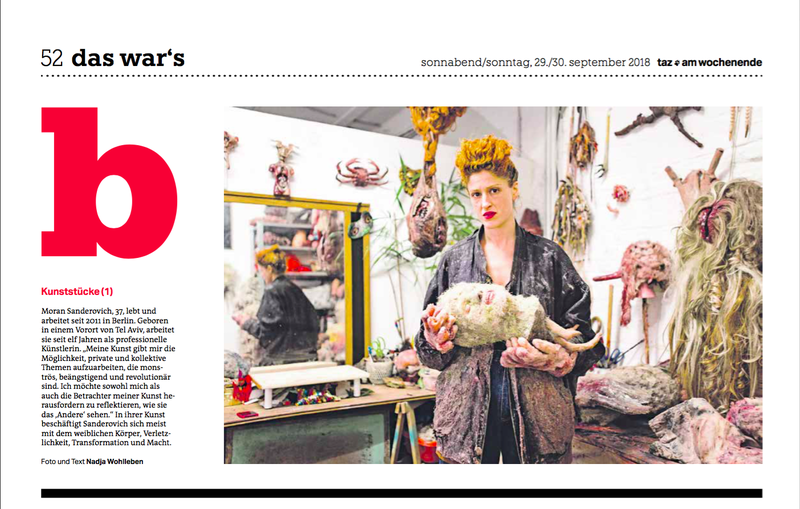 Happy to take over the weekly photo column of Berlin based newspaper TAZ for the next five weeks. For this column I'm portraying exceptional Berlin based artists. First up: Moran Sanderovich, 37, who has been living in Berlin since 2011. Born in a city on the outskirts of Tel Aviv, Israel, she has been working as a professional artist since eleven years. “My art gives me the possibility to observe and research private and collective topics in a different way such as monstrous, scary, revolting. I am willing to challenge myself as well as the viewers of my works to re-think what they see and to check their own gaze and patterns for perceiving the so called ‘other’”. In her works, Sanderovich’s mainly deals with the female body, vulnerability and transformation, power systems and the wound as an ultimate witness.